The Yoho-Team, who is welcoming backpackers since 1978 (big anniversary this year!) is very happy to accommodate you. We have been a proud member of „Europe’s Famous Hostels“ for almost 25 years! 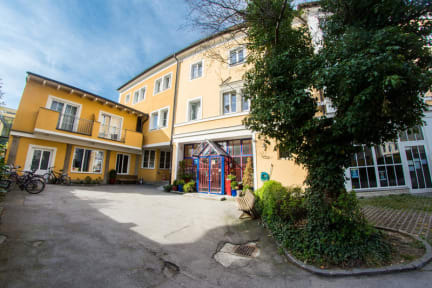 We are located only ten minutes away from the main train station and three minutes walking distance to the world famous „Sound-Of-Music DoReMi steps“. Our unique free city map will guide you to the main attractions in town. You can also make use of our bike rental service during summer season. We offer loads of free facilities including Wi-Fi, fresh linen, key-operated private lockers in the dorms, 24hr hot showers, book exchange, microwaves, water boilers, and fridge’s. Also, for all your nostalgia fans, we are screening the “Sound of Music” daily. Start the day with a great „All-You-Can-Eat-Breakfast-Buffett“, get your daypack ready and explore the city. You can pick up the „24hr Salzburg Card“ at the reception, which gives you free entrance to all attractions in the area. After an extraordinary day in town grab a cold pint of Stiegl at our bar and relax there or in one of our common rooms. Enjoy local austrian and international food served at the bar and benefit from our HAPPY HOURS DEALS while partying together with fellow travellers from all over the world. We are prepared to accommodate you all year round. Our front desk is open 24/7 so there is no lockout or curfew. Check-In starts at 2pm. We also have a luggage room, which is free to use before your check-in. An essential part of our effort to make your stay in Salzburg as convenient as possible is the support of our international and multilingual staff. They will give their very best to make you feel at home, managing your accommodation on a total of three floors with various room sizes, including dorms (8-,6-,4-bed, male, female or mixed) and comfortable private rooms. All of them with keycard-operated lockers and recently renovated showers. We are looking forward to welcome you soon! Prima Hostel! Niks op aan te merken. Leuk om andere mensen te ontmoeten in de bar. Everything was perfect except for one little detail: the drain was clogged with lots and lots of hair (3rd floor). Ideale locatie, dicht bij alle bezienswaardigheden en het station. Het personeel is erg vriendelijk en wil je altijd helpen. De sfeer is gezellig en de kamers zijn prima. Vriendelijk en behulpzaam personeel aan de balie. Keuken is wel heel erg klein, niet mogelijk om zelf te koken, wel om eten op te warmen. Prijs/kwaliteit-verhouding is prima. Wel 10 min. stappen van het oude centrum. A nice hostel, but it looks more like a hotel. The showers for the ladies was on the second floor while I had a room on the first floor. I liked the big lockers, where it was easy to store your luggage. The toilets where dirty but maybe I just got in at the wrong time, same for the showers. The location was very nice, only a ten minute walk to the "altstad" and a 10 minute walk to the station. Gezellige hostel op prima wandel afstand van de oude stad. This is not a nice hostel at all. I don't know why they have such good ratings. The atmosphere is terrible, like non-existent. There is no kitchen at all, you only have a small pizza-oven. I won't come back here again, even though it's cheap, it just was a bad experience!